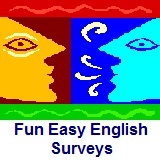 ﻿ Fun Easy English - new classroom free online classes english language lessons speaking listening writing reading january 27. 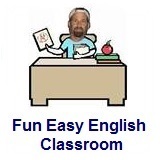 Today in the Fun Easy English classroom you are going to learn about sports and learn vocabulary. This is kind of an easy day in the classroom. Hi. In the classroom today you will learn a little about sports. A wide variety of sports are played throughout the world. Some people like high action sports like American football, soccer, and basketball. Others like racket sports such as tennis. Still others like baseball or hockey. There is also a difference between participation and spectator sports. Participation means actually getting involved or playing a sport. Spectator means only watching a sport either in person at a stadium or other location or on television. Many people like a sport enough to be a participant and a spectator. Either way, sports are a great way to relax and stay fit. Which sport do I LIKE the most? I talked about American football a lot in the January 26 lesson. Yup American football is my favorite sport. Why? The game is exciting and the players use speed, strength, and agility to achieve their goals. Which sport do I HATE the most? Really difficult question. I would probably say golf but this is maybe unfair since I never tried to play this sport before. I played Frisbee golf in college and really enjoyed it though. Golf is slow moving and seems like not very fun. Survey: Which sport do you LIKE the most? Most people are interested in at least one sport. Survey: Which sport do you HATE the most? Most people dislike and even hate at least one sport. In this lesson Anna does not feel well. She calls her boss and her doctor. What do they tell her to do? And will she follow their advice? Anna: Hello! I am sure that today, in Washington, D.C,. there are a lot of great things to do. But I am not doing any of them. I am sick. Right now, I'm going to call my boss and tell her I cannot come in to work. Anna: Ms. Weaver, Hi. I can’t come to work today. Caty: Why not? What is wrong? Anna: Well, yesterday I felt fine. Anna: In the morning, I painted for hours. In the afternoon, I cut wood. Then, I built a fire. Caty: Anna, what do you mean? Why can’t you come to work today? Anna: I do not feel well. I think I’m sick. Caty: I’m sorry to hear that. I was sick last week, too. I had the flu. Anna: (sneezes) What did you do? Caty: I slept a lot and I drank a lot of water. Do you have a doctor? Caty: You should call your doctor. And get lots of rest! Anna: Thanks, Ms. Weaver. I’ll call right now. I'm calling my doctor. Dr. Bennett: (to herself) Now, where does this thing go? Dr. Bennett: Hello. This is Dr. Bennett. How can I help you? Anna: Hello, Dr. Bennett. This is Anna. Dr. Bennett: Oh, Hi, Anna. How can I help you? Anna: I think I’m sick. Dr. Bennett: Let me ask you a couple of questions. Do you have a sore throat? Anna: Yes. I have a sore throat. Dr. Bennett: Do you have a cough? Anna: Yes. I have a cough. Dr. Bennett: When did you start feeling sick? Dr. Bennett: Excuse me, Anna. But I don’t need to know all that. Do you have a fever? Anna: Oh. My thermometer says 125 degrees?! What?? Dr. Bennett: Yeah, that’s not right. Anna: Oh. Wait. The thermometer was in my hot cup of coffee. Dr. Bennett: Please take it again, Anna. Anna: Okay, the thermometer says 100.5 degrees. Dr. Bennett: 100.5 degrees is not too high. I want you to drink lots of water. Rest in bed and get lots of sleep. Anna: That is what my boss said to do. Um, Dr. Bennett, when can I go to work? Dr. Bennett: Don’t go to work for a couple of days. Anna: Yes! I mean, I don’t want to make my co-workers sick. Dr. Bennett: That’s right. Call me back in a couple of days. Anna: I will, Dr. Bennett. And thanks. Anna: Well, you heard the doctor – no work for a couple of days. I need water, sleep and um … lots of movies! Well, the doctor didn’t say anything about movies. But it can’t hurt! Until next time! Learn to pronounce the new words for this lesson. 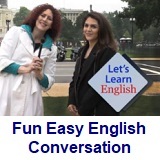 You also learn about irregular past tense verbs. Use this video to learn about how to ask two kinds of questions: WH-questions and Yes/No questions. What happens when you get the flu? Does your family have a special way to get well again? Write about it in the Facebook Comments section below. Then practice talking about health problems with a friend. Click lesson activity to get the printable PDF version. The page opens to a new window.